Kachemak Bay Birders has been producing Bird Rhythms in cooperation with Homer’s local public radio station, KBBI. 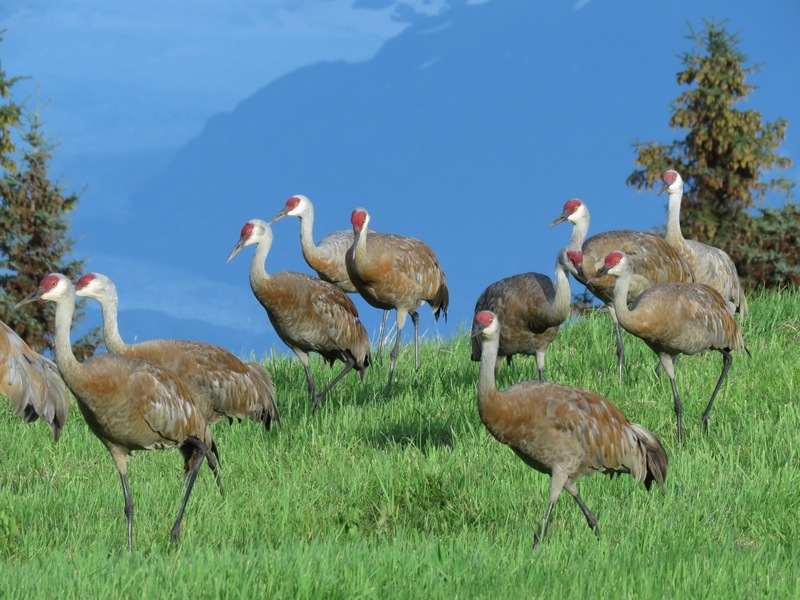 The April Bird Rhythms featured the Sandhill Crane and was written and read by Kachemak Crane Watch educator, Nina Faust. This entry was posted in Blog on May 12, 2018 by Nina Faust. 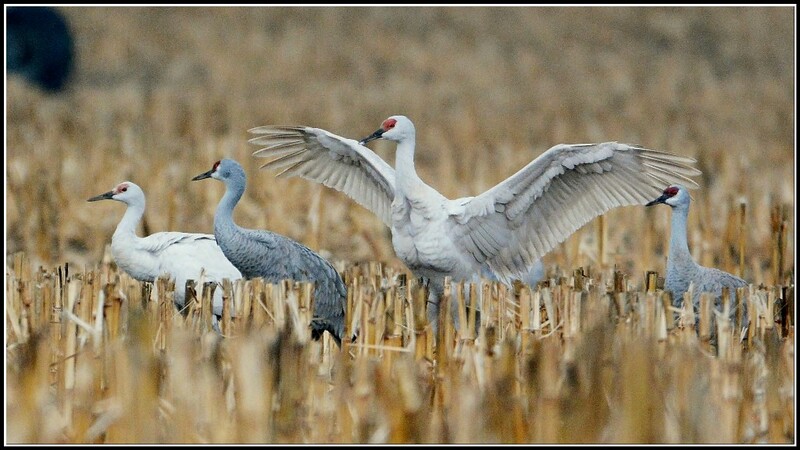 The Sandhill Crane count down has begun! With their arrival, consider some measures to ensure their safety and nesting success this summer. Nearly 25 years ago, Kachemak Crane Watch began studying and surveying cranes. 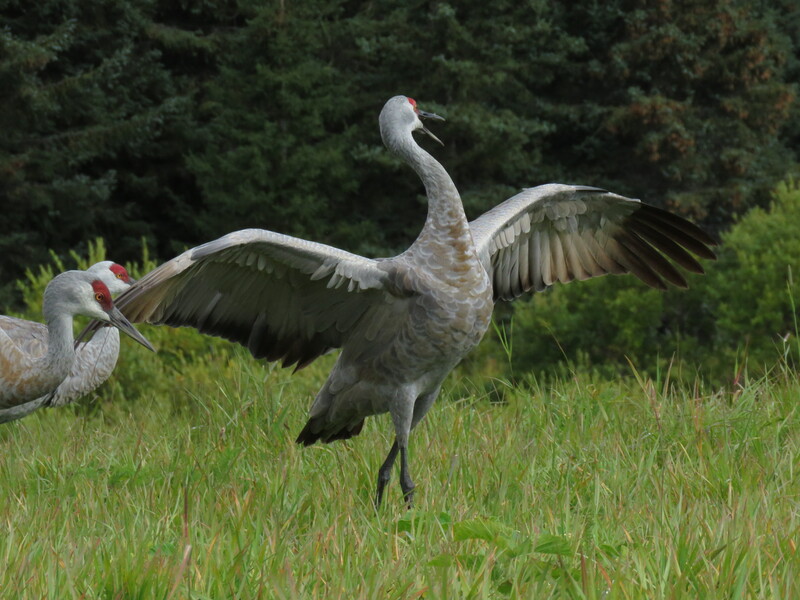 Kachemak Crane Watch, along with many Homer residents, have learned much about Homer’s beloved Sandhill Cranes – their nesting habitat, nesting success, migration routes, and wintering locations. However, as Homer’s population has increased and additional land has been developed, more Sandhill Cranes are nesting in yards within the Homer city limits and non-breeding flocks are hanging out in busy neighborhoods, a potentially dangerous trend. A major contributing reason for this, in part, is because more people in town are putting out corn for the cranes. 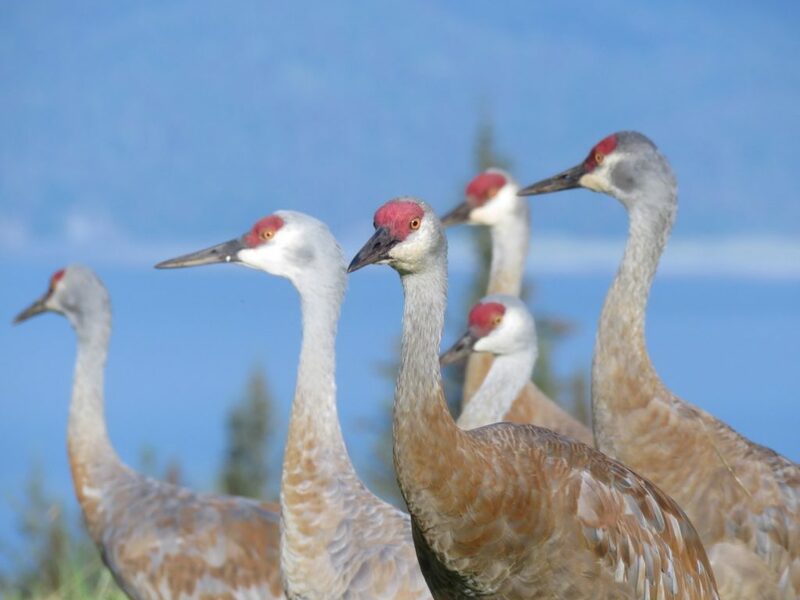 While we love our Sandhill Cranes, we don’t want to see cranes injured or killed by motor vehicles or dogs, or susceptible to other urban hazards such as collisions with power lines. Nor do we want to see people or pets injured by cranes protecting their chicks. 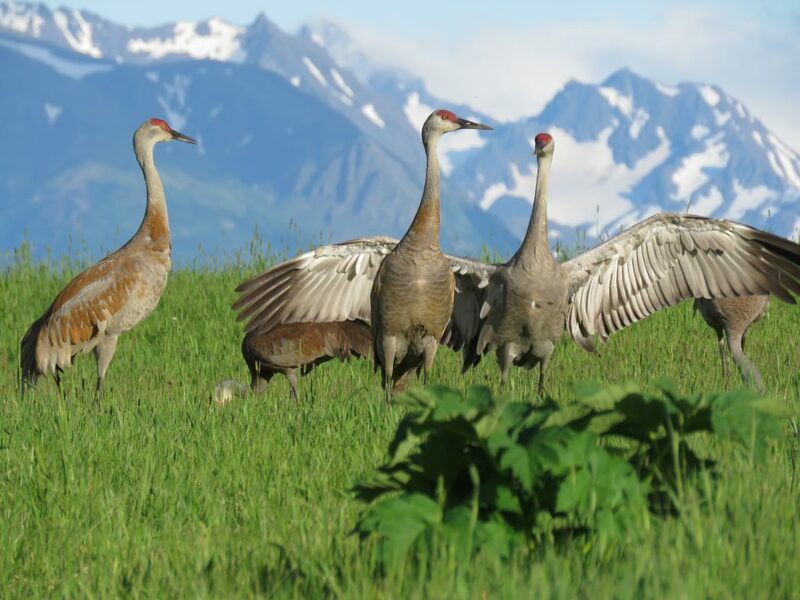 Therefore, Kachemak Crane Watch is asking people in town not to put out corn for Sandhill Cranes this summer. Surprisingly, there is plenty of natural food for cranes. In addition to exposure to predation and other hazards, cranes within city limits are in an urban habitat unlike their natural habitat. A more balanced diet found in a natural habitat provides protein and other nutrients not available in corn. Cranes habituated to an urban setting are more exposed to predation risks due to open areas and poor nest sites, have sub-prime habitat to raise their flightless chicks (colts), and urban habitat often lacks essential protein food sources critical to colt development. Also, colts are very susceptible to toxic chemicals used on urban lawns. A colt born in June will be flightless until fledging in late August, early September – that colt in an urban habitat is very exposed to predation. 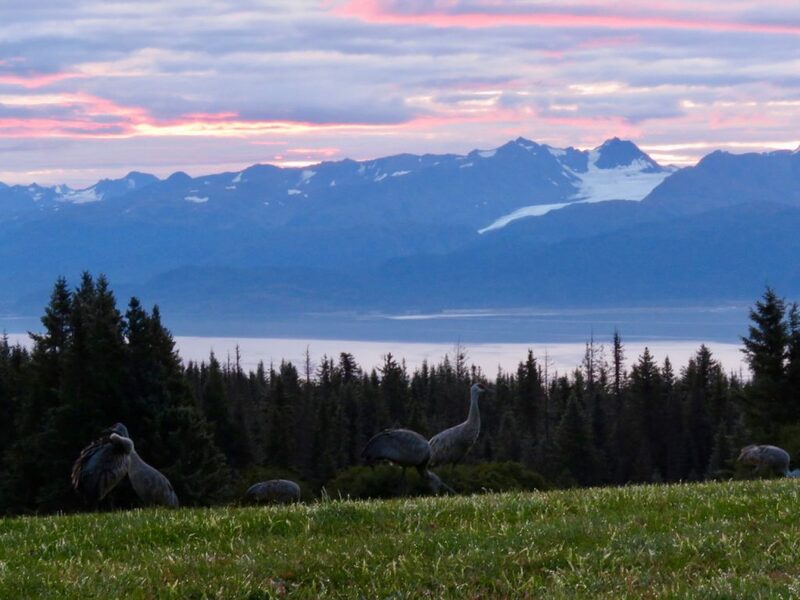 Over the summer Kachemak Crane Watch will continue to closely monitor cranes within the Homer city limits and impacts of in-town feeding on crane survival, habitat preferences, and interactions with humans. If you live within the City of Homer, please take the voluntary action of protecting cranes by not feeding them. 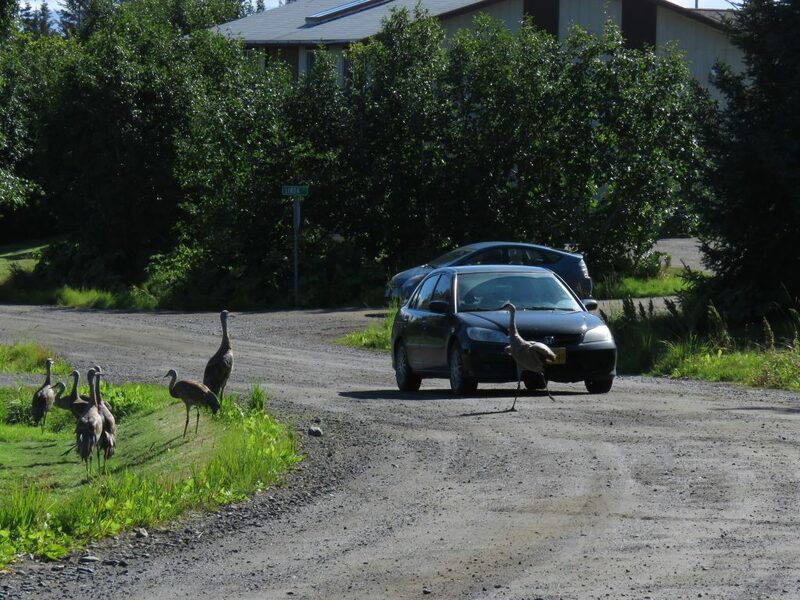 Turning the cranes into urban birds that can become nuisances, road hazards, or casualties themselves may force the Homer City Council to pass an ordinance against feeding cranes in the city limits. Much better to heed the cautionary signs and voluntarily use common sense in not attracting them into these hazardous settings. Enjoy a walk on the Beluga Slough boardwalk below the Islands and Ocean Visitor Center to observe nesting cranes and watch them raise their colts in a natural habitat. In late August and early September, enjoy the spectacle of over 100 cranes at evening sunset flying into Beluga Slough to roost and feed. Remember, feeding cranes is not necessary. They will find plenty of high protein food to raise their young without extra feeding humans provide. They will also find better habitat to nest and protect their young from predators and urban hazards. Cranes are important to Homer – to the people, to our economy. We love our cranes, so it is all about the cranes and doing what is best for them. We must use common sense and not attract them to where they can get hurt or killed or hurt humans or their pets. 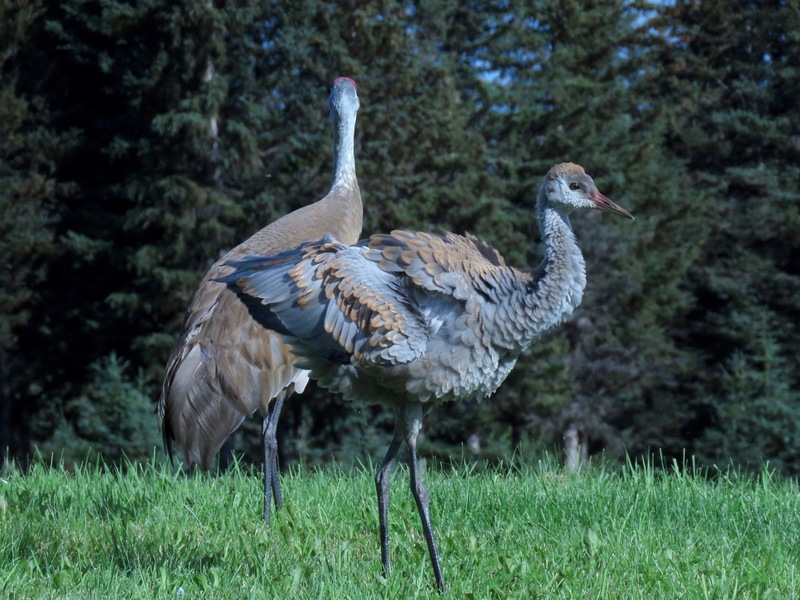 If you live in town, please refrain from feeding the cranes to ensure our Sandhill Cranes and their colts have a safe summer in Homer. A crane barely gets out of the way of a passing car in a neighborhood in town. This entry was posted in Blog on April 12, 2018 by Nina Faust. 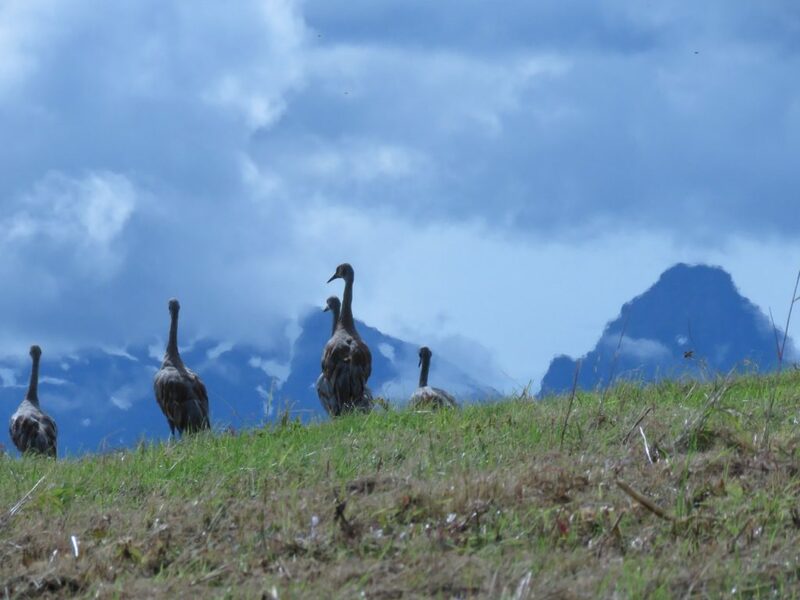 This entry was posted in Blog and tagged Bird of the Month, Kachemak Bay Birders on April 1, 2018 by Nina Faust. Kachemak Crane Watch received this note from Dave Goeke on March 30, 2017. Last summer the leucistic crane showed up in the Mat-Su area. If anyone sees this crane and its colt, please let me know. Send photos if you are able to get any of the crane and/or its colt. Thanks! Photo provided by Dave Goeke. Heads up. The leucistic crane nested successfully last year! It is now accompanied by a leucistic juvenile from last season. The two were first photographed February 26 flying together over Consumnes River Preserve about 40 miles south of Sacramento, California. They were next photographed on the ground March 3 near Burns, Oregon. They were first observed here when I photographed them four miles south of Othello, Washington, on March 21 in the same cornfield where I photographed the adult last year. They have been seen here again on March 22, 25, and 26. They might still be here, but it appears a significant number of cranes might have moved on today. As I recall, last year the adult left about mid-April and arrived outside Palmer, Alaska, nine days later. I just thought you would like to know so you can get the word out to those who might want to know the birds are coming. This entry was posted in Blog and tagged colt, Leucistic Crane on March 31, 2017 by Nina Faust. A sandhill crane looks and sounds like a modern day dinosaur. They stand about three feet tall and have a six-foot wing span. They use their sharp four-inch beak for probing in the dirt and catching insects and small mammals. And sometimes, they use that long beak for defense. This entry was posted in Blog on September 27, 2016 by Nina Faust. 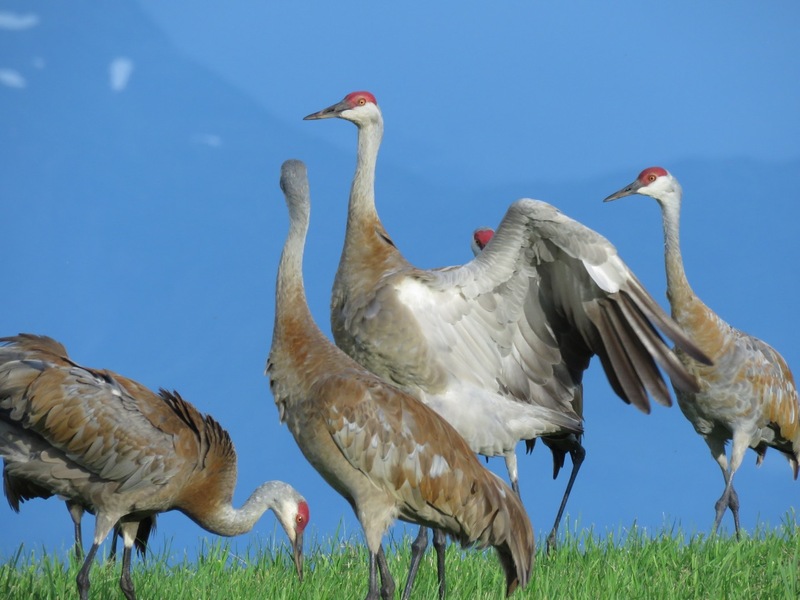 Kachemak Crane Watch needs your participation during Kachemak Crane Watch’s annual Sandhill Crane Count Days. Please share this info with other crane lovers and count the cranes where you see them with the needed info as noted in the poster below. Please submit your info on the day of each count, or as soon as you can before the next Count Day. Send all observations to reports@cranewatch.org or by call 907-235-6262. For more information, contact Nina Faust at 235-6262. This entry was posted in Blog on August 22, 2016 by Nina Faust. This entry was posted in Blog on July 9, 2016 by Nina Faust. The genus Antigone has been split from Grus. Scientific names for Whooping and Common cranes remain unchanged, but Sandhill Crane has changed from Grus canadensis to Antigone canadensis. The other members of Antigone are White-naped Crane*, Brolga*, and Sarus Crane*. Antigone is the name of Oedipus’s daughter/half-sister in Greek mythology.